Luethge, D., Tanaka H., Amatucci M., Vas A., & Byosiere P. (2015). Global Comparisons in Motives for Car Use between Belgium, Brasil, USA and Japan: Effects of Gender, Urbanization and Cultural factors. Gerpisa colloquium. Motives for Car use among Young Belgian Adults: Are young European drivers different from their US, Brazilian and Japanese peers? Luethge, D., & Vas A. (2015). Motives for Car use among Young Belgian Adults: Are young European drivers different from their US, Brazilian and Japanese peers?. Gerpisa colloquium. Moniz, A., Krings B., Van Hootegem G., & Huys R. (2002). 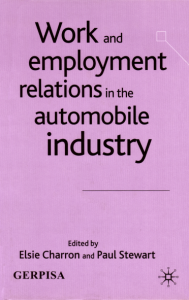 Technological practices in the European auto industry: exploring cases from Belgium, Germany and Portugal. Int. J. of Automotive Technology and Management. 2(1), 84-100.